Big savings! 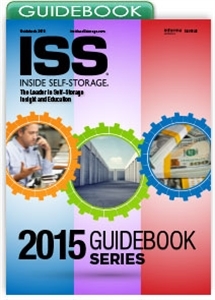 The Inside Self-Storage 2015 Guidebook Series contains all three publications at a discount of more than 20 percent. Get detailed insight on building, investing, ownership, management and more. Building/Investing Guidebook 2015 – Designed to help those interested in self-storage investing as well as those who want to establish or expand an operation, this Guidebook addresses real estate, finance, development and construction. Facility-Management Guidebook 2015 – Expanded for 2015, this Guidebook addresses key aspects of a self-storage manager’s duties and provides insight to sales, legal issues, money management, marketing, maintenance and more. Ownership Guidebook 2015 – Designed to help self-storage owners maximize their investment, this newly expanded edition covers revenue management, marketing, staffing, outsourcing, security, technology, insurance and more.